WIKIPEDIA: The Fifth Congressional District, in which Blagojevich lived, had long been represented by the powerful Democrat, Daniel Rostenkowski, who served as chairman of the House Ways and Means Committee. Rostenkowski was defeated for reelection in 1994 after pleading guilty to mail fraud, being succeeded by Republican Mike Flanagan. In 1996, Blagojevich defeated Flanagan with support from his father-in-law, and went on to serve three terms in the United States House of Representatives. On October 10, 2002, Rod Blagojevich was among the 81 House Democrats who voted in favor of authorizing the invasion of Iraq. He was the only Democrat from Illinois to vote in favor of the Iraq War. WIKIPEDIA: In the 2002 Illinois gubernatorial general election, Blagojevich defeated Republican Illinois Attorney General Jim Ryan. Blagojevich’s campaign was helped by his connected father-in-law, Chicago alderman Richard Mell. Ethics scandals had plagued the previous administration of Republican George Ryan (no relation to Jim), and Blagojevich’s campaign focused on the theme of “ending business as usual” in state government. WIKIPEDIA: Polling completed on October 13, 2008 put Blagojevich’s approval rating among Illinois voters at 4%. 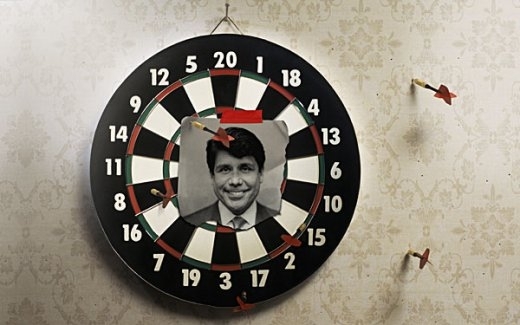 Blagojevich ranks as “Least Popular Governor” in the nation according to Rasmussen Reports By the Numbers. On October 23, 2008, the Chicago Tribune reported that Blagojevich suffered the lowest ratings ever recorded for an elected politician in nearly three decades of Chicago Tribune polls. The survey of 500 registered likely voters conducted showed that 10 percent wanted Blagojevich re-elected in 2010, while three-fourths said they didn’t want him back for a third term. 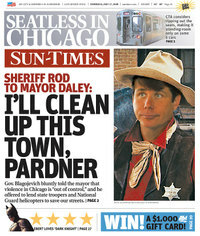 The survey also showed only 13% approved of Blagojevich’s performance, while 71% disapproved. WIKIPEDIA: On October 11, 2006, Blagojevich fundraisers and businessmen Antonin “Tony” Rezko and Stuart Levine were indicted for participation in a scheme to obtain kickbacks from investment firms seeking business from two state boards. Levine pleaded guilty two weeks later and agreed to testify against Rezko. The governor’s wife, Patricia Blagojevich, was a business partner of Rezko’s for at least a decade. In 2004, she received over $38,000 in real estate commissions from him. Blagojevich was widely rumored to be the unnamed “Public Official A” mentioned in the Rezko indictment. The governor repeatedly denied that he was Public Official A, but on February 26, 2008, the judge in the case issued a ruling which confirmed his identity. A pretrial ruling in the case from U.S. District Judge Amy St. Eve named the Blagojevich campaign and confirmed that Blagojevich was the intended beneficiary of at least one of Rezko’s extortion attempts. Blagojevich was not charged in the indictment, although prosecutors have asserted in other court filings that he told a top Democratic fundraiser that he could steer contracts, legal work and investment banking in order to help with fundraising. This entry was posted on Tuesday, December 9th, 2008	at 3:13 pm	and is filed under News	. You can follow any responses to this entry through the RSS 2.0	feed. You can leave a response, or trackback from your own site.